In a pot, sauté onions with olive oil. Then add tomato paste and tomatoes, sauté over medium heat for 2-3 minutes. Stir in chopped cabbage and cook over low heat covered for about 20 minutes. Then, add salt, chili pepper, and hot water if necessary. If there is no juice left in the pot then go ahead and add hot water. Close the lid and simmer over low heat until cabbage is cooked (about 20-25 minutes). Serve with either plain or garlic yogurt on top. Bir tencerede sogan ile zeytinyagini kavurun. Sonra domates salcasi ve domatesi ilave edin ve orta ateste 2-3 dakika daha kavurup dogranmis beyaz lahanayi ilave edin. Bir sure kavurduktan sonra, kapagini kapatin ve kisik ateste yaklasik 20 dakika pisirin. Son olarak tuz, pul biber ve gerekirse suyu ilave edin. Eger tencerenin dibinde su kaldiysa tekrar su ilave etmenize gerek yoktur. Kapagini kapatarak kisik ateste lahana yumusyana dek pisirin (yaklasik 20-25 dakika). Servis onerisi olarak; sade ya da sarimsakli yogurt ile servis yapabilirsiniz. 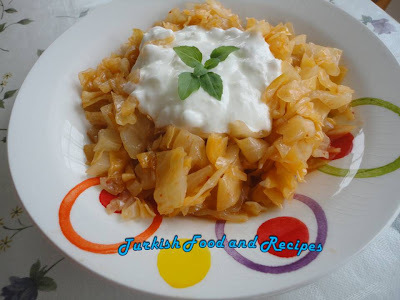 I love cabbage and this is such a great side dish.